It is a dire time in the realm. All the youngest children of the castle have been put into playpen purgatory by the new evil king. Yup, they are all imprisoned in the high tower of the castle and there's just no hope of getting them out of the King's reach. Well, there might actually be one chance. Because one brave child has escaped the grasp of the mad king and frankly, he's the only one who can stop the monarchy from ending all the fun times in the kingdom. And guess what? It's your child! But they'll only be able to save the day if you equip them with the right gear. When you outfit your little boy or girl in this shining knight costume, they're sure to feel powerful enough to change the course of the entire empire. 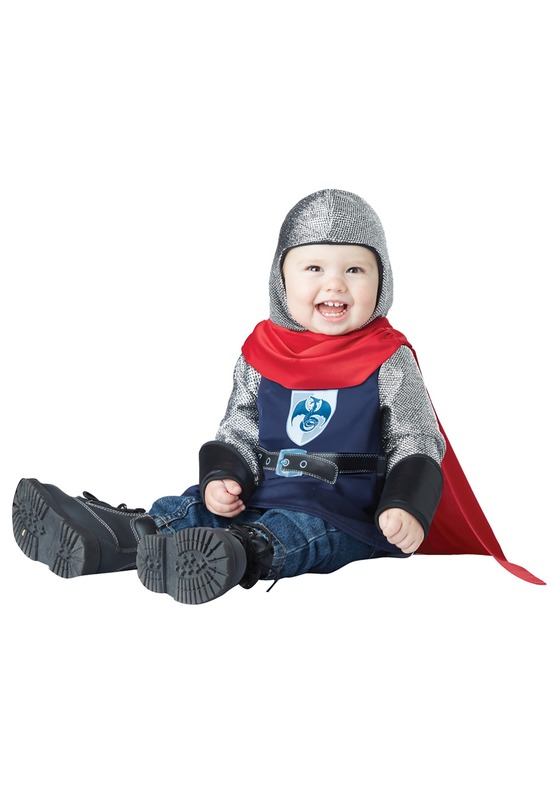 With a shimmering shirt that looks just like chain mail and a tunic, your little one will have the gear to battle any threat to good times. With a stunning red cape, they'll be ready to ride on their trusty horse and grab a sword and get down and dirty while they battle some villains. We're sure your child will fulfill their destiny when you get them this adorable costume. And we're sure no one will notice if you still have to hold their hand while they battle the bad guys!